And be ready for the urge to return. Hartner knows that from experience. She hopes more people will come to love Candlelight like she has. Don Barr, his wife, Jeri, and his brother, Randy, started Candlelight Ranch in 1999 with the idea of creating a place where kids could experience the outdoors and come to respect the land and themselves. Its mission is to reach special populations of youth: those with physical disabilities and kids from urban areas who only know the “outdoors” as concrete and pavement. Candlelight Ranch partners with several community groups and organizations such as the Boys and Girls Club of the Highland Lakes, Phoenix Center of Marble Falls, Falls Career High School, and Juvenile Justice, which serves seven counties, including Burnet and Blanco. It also reaches out to Austin-area entities such as the Texas School for the Deaf and the Texas School for the Blind and Visually Impaired. “We tailor-make a program for each (group’s) specific needs and goals,” Hartner said. That puts Candlelight Ranch in a unique category. It creates a camp experience for youth of almost any ability and background. For example, it hosted an overnight camp in December for a group of blind students on one of the coldest nights of the year. How many camps or programs could create an outdoor experience for the seeing-impaired then pull it off under such challenging weather conditions. That’s exactly what Candlelight Ranch does. Lynette Holtz, Candlelight’s program director, explained that the beauty of the camp is it really allows nature to do most of the heavy lifting. 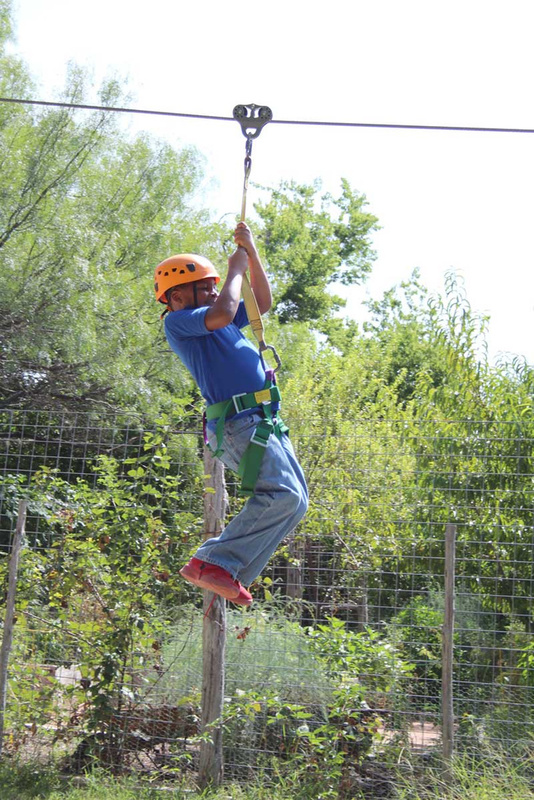 The staff and volunteers simply provide ways for kids to experience the outdoors through camping, nature hikes, zip lining, and Carlyon’s Canyon Crawl (a high-cable crossing). “The outdoors is a great way for kids to build their confidence and grow,” Holtz said. Hartner agreed with Holtz’s assessment of nature’s power. It appears to work because interest in Candlelight Ranch’s services continues to grow, both in the number of youth it serves and the organizations with which it partners. Hartner said that, in 2016, the camp served approximately 1,600 youths and their families. In 2017, that number jumped to 2,300 youths and their families. Candlelight Ranch offers unique camps and programs. There’s Camp Dream Catcher, created specifically for children in foster care, and Camp Glimmer, which provides outdoors opportunities for inner-city youth, particularly from East Austin. Tara Gray, the ranch’s development director, pointed out that many kids from the inner city don’t get much, if any, exposure to the outdoors beyond a city park. Candlelight Ranch, nestled along the shore of Lake Travis, provides an oasis of sorts for these kids. Many arrive for Camp Glimmer unsure, even scared, of being outdoors, but in a day or two, they develop self-confidence and experience an almost renewal in their human spirit. “It’s a very special place,” Gray said. She knows how special it is, not just because she’s the development director or because she’s served as the board president twice in the past, but from her very personal connection. Tara’s daughter, Reese, passed away in 2006 after a battle with a terminal illness. Reese’s doctor introduced Gray and her family to Candlelight. The place clearly was a magical one for them. Seeing its impact on the lives of so many people, Gray became an advocate for the facility. The Candlelight Ranch treehouse is known as Reese’s Treehouse in memory of Gray’s daughter. Last year, Candlelight Ranch expanded its services to include a monthly excursion for veterans, current service members, and their families. The need clearly existed for such a program because the retreats fill up within days of opening registration. When a place such as Candlelight Ranch experiences strong growth, it’s often at a cost. The place can lose some of what makes it special. The Candlelight Ranch staff and board are aware of that and have crafted a vision and plan to allow for growth without losing the things that make it so special to all who visit. While Candlelight Ranch provides a number of services for its Highland Lakes partners, the staff isn’t sure the rest of the community knows about the program, what it offers, and its impact. That’s one of Gray’s goals: to make connections within the Highland Lakes and share the Candlelight story. “There are some incredible people in the area who, I think, could really make a difference in kids’ lives out here,” Gray said. The volunteer skill sets for which Candlelight Ranch is looking is wide and varied. You don’t have to be an outdoors expert or a modern-day Daniel Boone. Other opportunities include helping with the programs, assisting with fundraising, and promoting the facility. Gray added that there’s always room to create more partnerships with other groups and organizations. The problem, if you could even call it one, is once Candlelight Ranch gets into your heart, you’re always part of it. Just ask Hartner, who joined the staff in 2010 as program director then left as she and her husband moved to Malaysia for four years. When she returned to Texas during visits, Hartner stopped at Candlelight Ranch to visit with staff, board members, and volunteers. When she and her family returned to Texas, Candlelight “reclaimed” her as first the volunteer coordinator in 2016 then its executive director in February 2017. Candlelight Ranch just weaves its way into the fabric of a person. Go to candlelightranch.org or email Gray at tara@candlelightranch.org for more information about Candlelight Ranch or to invite her to speak to a group or an organization. • the second annual Candlelight Ranch Chili Cook-off and Car Show from noon-4 p.m. Sunday, Feb. 11. General admission is $20 for adults and $10 for ages 17 and younger. Tickets are available at candlightranch.org. • Family Earth Day on Sunday, April 15. More details are coming. • Summer Family Day on Sunday, June 10. More details are coming. The ranch, located at 6408 Muleshoe Bend Trail between Marble Falls and Lago Vista, will also be open to the public Tuesday, May 1, during the Marble Falls Paint the Town plein air competition and art celebration.